In this prequel to Eon, Greg Bear continues to explore the possibilities presented by the asteroid Thistledown, a remnant of a lost human civilization. The Way is a tunnel through space and time that leads to other worlds, some more like planet Earth than Earth itself. It is perhaps the most formidable discovery in Thistledown and with it come disputes as to the nature of the Way and how it should be used. The Way can be reached only through Axis City, the only space station of Thistledown. The ruling body of Axis City, the Hexamon, has decreed that other worlds reached by The Way must be left untouched as an insurance against future needs of the human race. But then the Hexamon hear of a group of clandestine colonists who have settled on one of the new worlds. Olmy Ap Sennon is an eager young career soldier who must go and investigate this illegal colony, and at the same time confront his own humanity. As he witnesses the hardship and beauty of the outlaw human colony, he learns what it means to struggle with war, ecological disaster, love, and death. 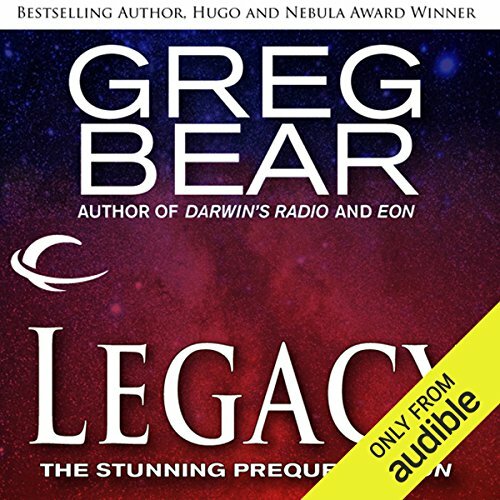 ©1995 Greg Bear (P)2012 Audible, Inc. While not a bad story in and of itself, this book is only very loosely related to Eon and Eternity. If you like books about surviving on alien planets, this story may be for you. If you're looking for a story about Thistledown and the Way and Jarts, this is not the book for you.